It has been 10 years since the launch of the original Valkyria Chronicles, the innovative turn-based strategy RPG that took the world by storm. Fans around the world can finally experience the other side of the Second Europan War and its most brutal campaign, Operation Northern Cross, in Valkyria Chronicles 4 - available now on Nintendo Switch, PlayStation 4, Xbox One, and Steam! CANVAS Aesthetics - The series' signature hand-drawn visual style is back and overhauled for the newest generation. Inspired by water color compositions, the CANVAS Graphics Engine blends visual elements of reality and imagination to create an expressive world filled with colorful emotions. Watch the journey of Squad E unfold like an interactive painting! Take the fight to the Empire with the Valkyria Chronicles 4 'Memoirs from Battle' premium edition, and dive into two new adventures with your favorite Squad 7 characters from the original Valkyria Chronicles. This special edition release ($99.99) comes equipped with an exclusive artbook themed as Claude's travel journal from the game and a replica of his mighty tank, the Hafen. Arm yourself for the battle ahead by pre-ordering the 'Memoirs from Battle' premium edition today at http://valkyria.sega.com! Exclusive Vinyl Statue of the 'Hafen' Tank - Triumphantly bursting onto the scene, the 'Hafen' tank vinyl statue is ready to conquer the snowy battlegrounds of Europa. More than just a tank, the 'Hafen,' named after Claude's hometown in Gallia, is a meaningful symbol for all of Squad E's members. This version may not have the firepower of the original, but it makes a great centerpiece for any fan's collection! 'Claude's Travel Journal' Exclusive 100-Page Themed Artbook - Valkyria Chronicles 4's story is told through the photos, notes, and memories captured in Claude's travel journal. This exclusive artbook, inspired by Claude's journal in-game, features a wide selection of the beautiful watercolor-styled art from Valkyria Chronicles 4. 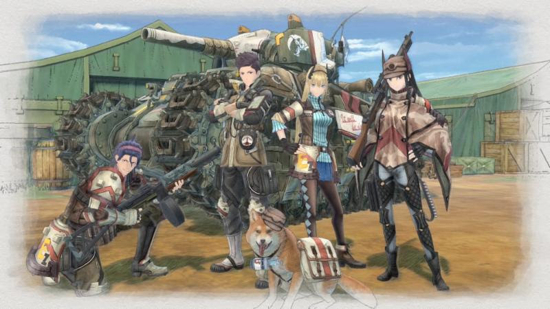 A Pair of DLC Adventures Featuring Squad 7 Characters - 'A United Front with Squad 7'and 'Edy's Advance Ops' reunite fans of the original Valkyria Chronicles with the soldiers of Squad 7. Fight alongside Welkin, Alicia, Isara, Rosie, Largo, and Edy in over 3 hours of gameplay across 4 exclusive story missions, featuring fully-voiced cutscenes and unique challenges! 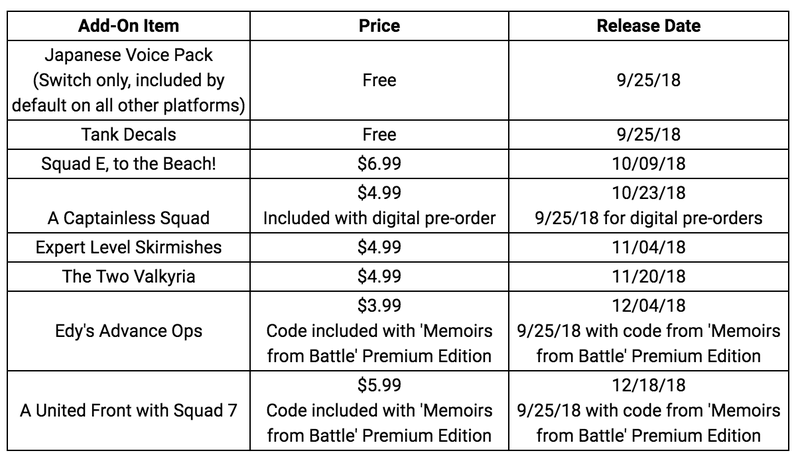 After completing these missions, you'll unlock those six Squad 7 members, as well as Edy's personal submachine gun for use in your army in the main game. Bolster your forces with the renowned soldiers of Squad 7! 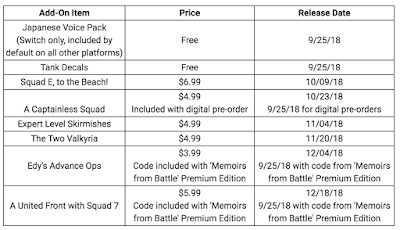 *Squad 7 DLC missions are available immediately through a download code included in the 'Memoirs from Battle' edition. They will be available as an add-on item on all platforms around the game launch.